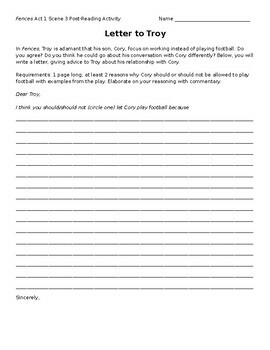 This post-reading activity for Act 1, Scene 3 of August Wilson's Fences allows students to take a position about whether Cory should be allowed to play football. It requires students to do a close reading of scene 3 and, in particular, the tumultuous relationship between Cory and Troy. It also requires them to take a position and support that position with reasons and evidence from the play.